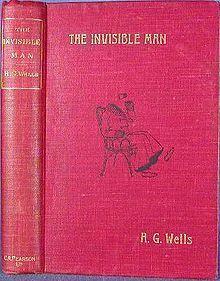 The Invisible Man is a science fiction novella by H G Wells. Originally serialized in Pearson's Weekly in 1897, it was published as a novel the same year. A mysterious man, Griffin, arrives at the local inn of the English village of Iping, West Sussex, during a snowstorm. The stranger wears a long-sleeved, thick coat and gloves; his face is hidden entirely by bandages except for a fake pink nose; and he wears a wide-brimmed hat. He is excessively reclusive, irascible, and unfriendly. He demands to be left alone and spends most of his time in his rooms working with a set of chemicals and laboratory apparatus, only venturing out at night. While Griffin is staying at the inn, hundreds of strange glass bottles (that he calls his luggage) arrive. Many local townspeople believe this to be very strange. He becomes the talk of the village. Griffin runs out of money and cannot pay for his board and lodging. When his landlady demands that he pay his bill and quit the premises, he reveals part of his invisibility to her in a fit of pique. An attempt to apprehend him is frustrated when he undresses to take advantage of his invisibility, fights off his would-be captors, and flees to the Downs. There Griffin coerces a tramp, Thomas Marvel, into becoming his assistant. With Marvel, he returns to the village to recover three notebooks that contain records of his experiments. When Marvel attempts to betray the Invisible Man to the police, Griffin chases him to the seaside town of Port Burdock, threatening to kill him. Marvel escapes to a local inn and is saved by the people at the inn, but Griffin escapes. Marvel later goes to the police and tells them of this ‘invisible man’, then requests to be locked up in a high-security jail. Griffin's furious attempt to avenge his betrayal leads to his being shot. He takes shelter in a nearby house that turns out to belong to Dr. Kemp, a former acquaintance from medical school. To Kemp, he reveals his true identity: he is a former medical student who left medicine to devote himself to optics. Griffin recounts how he invented chemicals capable of rendering bodies invisible, and, on impulse, performed the procedure on himself. Griffin burned down the boarding house he was staying in, along with all the equipment he used to turn invisible, to cover his tracks; but he soon realised that he was ill-equipped to survive in the open. He attempted to steal food and clothes from a large department store, and eventually stole some clothing from a theatrical supply shop and headed to Iping to attempt to reverse the invisibility. Now he imagines that he can make Kemp his secret confederate, describing his plan to begin a ‘Reign of Terror’ by using his invisibility to terrorise the nation. Kemp reports Griffin to the local authorities and when they arrive Griffin fights his way out. The next day he leaves a note announcing that Kemp himself will be the first man to be killed in the ‘Reign of Terror’. Kemp, a cool-headed character, tries to organise a plan to use himself as bait to trap the Invisible Man, but a note that he sends is stolen from his servant by Griffin.